Ven III is a volcanic planet located on the outskirts of the Joint Occupation Zone and the third planet in the Ven system. During the Human-Covenant War, the planet was used on and off by the Covenant as a staging area for large offensives. At the conclusion of the war, Ven III was left unclaimed. One of the planet's many underground caverns became a hot spot for numerous Kig-Yar pirates, smugglers, black market arm dealers, and slavers. The Office of Naval Intelligence sent an analyst report to UNSC High Command concerning the pirates on the planet and the possible outcomes if they are ignored. When the UNSC did not act, ONI hired a Sangheili mercenary have Kig-Yar pirates on the planet create an alleged biological agent in early May 2558 in order to lure the UNSC to the planet to eliminate the pirates. At some point, the Kig-Yar were killed by the bioweapon, and the Sangheili survived and fled the laboratory carrying the bioweapon in a containment cylinder. On May 8, 2558, a UNSC spy drone was scouting the surface of the planet when it discovered the deceased Kig-Yar. Admiral Serin Osman was alerted and tasked the UNSC Infinity with investigating the Covenant bioweapon research laboratory on Ven III. Warned to exercise extreme caution, Captain Thomas Lasky sent SPARTAN-IVs Naiya Ray and Gabriel Thorne to the planet. Deployed to Ven III by a prowler, the Spartans encountered several hostile Kig-Yar before entering a communication jamming field. Meanwhile, the lone Sangheili destroyed the UNSC drone on the planet. The Spartans soon found a Covenant structure, but they were attacked by the Sangheili and a contingent of Kig-Yar. During the skirmish, the Sangheili captured Thorne and escaped on a Type-32 Ghost. During her attempt to rescue Thorne, Spartan Ray discovered a massive Kig-Yar pirate stronghold deep below the surface of the planet. However, a Kig-Yar ambushed her and Ray's communications with Infinity ended. After Ray defeated the Kig-Yar and regained communications with Infinity, she entered the pirate base. Meanwhile, Infinity made its way to the planet. While the Sangheili spoke with the Kig-Yar pirate queen that led the Kig-Yar on the planet, the Infinity arrived in system and the queen had all of her ships prepare to engage the UNSC vessel. While the queen left to lead the battle, her lieutenants and the Sangheili were attacked by Ray. After killing the Kig-Yar and stopping the Sangheili, she rescued Thorne and gave Infinity their coordinates so Thorne could be recovered. 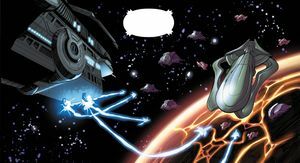 While the queen was preparing to take a corvette to engage Infinity, a pair of GA-TL1 Longswords deployed HAVOK missiles on the base, killing the queen. The space battle ended shortly after. The distraction of the blast allowed the Sangheili to escape, but when Ray caught him, a prowler landed nearby and ONI agents ordered her to stand down, seized the bioweapon, and led the unrestrained Sangheili onto the prowler. Later, Lasky and Spartan Sarah Palmer came to realize that ONI was responsible for causing the battle and the two contemplated the situation. Ven III is a small, barely inhabitable planet characterized by a maze-like environment with numerous caves and tunnels. Despite its barrenness, the planet is home to a small lizard-like creature which the Kig-Yar sometimes shoot for sport. A UNSC spy drone traverses over Ven III's landscape. A Kig-Yar on the surface of Ven III. Note the spires in the background. A reptilian creature on Ven III. A Covenant hideout on the planet. A view of Ven III's tunnel systems. The pirate base under Ven III. UNSC and pirate forces engaged in combat over Ven III. UNSC aircraft enter Ven III's atmosphere.